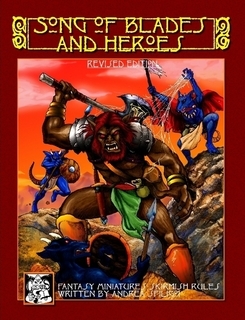 When I first looked at Songs of Blades and Heroes by Ganesha Games a few years ago, I didn’t think I was going to like it. The artwork was nice, but it didn’t wow me and when I found out it was just a set of rules, my idea of this being a good game started to go downhill a little. But then I read the rules. Then I read them a second time to make sure I had a better grasp of what I thought they were about. The old saying about “not judging a book by its cover” sprang to mind as I was so wrong…this was going to be a great game. As gamers, we all have collections of miniatures from games we’ve stopped playing and Songs didn’t care about who made the mini’s you were using. It didn’t care what type of base you were using either. What really grabbed me though, was the idea that not only had the writer, Andrea Sfiligol, created a system that let me create my own forces, but I could mix them. The game didn’t have a world, I was free to create my own, and if I wanted to mix Undead and Dwarves, I could. Hell it even let me mix Minotaur’s, with Humans, with Vampires with!!!! In fact it didn’t limit me at all. That to me was great as I could play what I wanted, with what I wanted and no one could argue that I was being stupid. You can also play any scale as well so 15mm, 28/32mm whatever covers your collection. The rules are very easy to learn and very simple to understand. Models have actions based on their Quality, you can roll up to 3 dice per model and each roll the Quality or higher is an action. Be that an attack, spell, movement. Now whilst everyone will be thinking great low level Quality for me, it’s all about cost, lower quality higher points. Also if you roll 2 or more failures on the quality roll its turn over for you. What you didn’t move that guy you really needed. Your Leader is in a bad position, oh dear. So you have to balance the force, good quality means you may have more actions, but they cost more. Same with the combat score higher means you hit better, but they cost more. So you have to balance out what you take depending on the size of game you’re planning to play. Combat is based around the Combat score of a model, plus a D6 and some modifiers. To kill a model you need to double your opponents score. Might sound hard and often it is, you win by a few the model maybe pushed back or knocked down. But if they get knocked down there easier to kill, bring a few friends people become easier to kill. Take certain skills guess what..
skills are what finish off a model. The main book, and those that come afterward, give players a lot more skills, scenarios and even a campaign system (Maybe a subject of another article) to expand gameplay. There is even a set of rules that allows you to go dungeon delving! Really, what set of rule out there my any of the main players cover such a broad spectrum of game play? But the rules aren’t perfect, and none I know are. There are always a few bits that make you wonder why, but they are all easily changed. A few house rules, some simple ideas and you make it what you want it to be. Also, just think reusing all those old miniatures has to be a great idea! Thank you! Perfection is subjective, i guess. What would work for a gamer would not work for another. But I like that people take the rules as a framework for creating their own games. I think this is the main reason for the enduring success of the rules. And for those who do prefer more detailed rules and a setting, I think we are doing that with the Advanced Song of Blades rules now.